GPS HUD Head Up Display: Vision Has Never Been As Clear As Now! The head up display shows/reflects just enough information directly into the driver's field of view, allowing you to maintain constant focus of the traffic, with no extra distraction. Also, you don´t need a additional GPS unit due to turn-by-turn navigation features of modern smart phones apps. It will reflect any HUD-based app (GPS Navigation) image or YouTube video clearly in front of your eyes, letting you see the navigation instructions clearly without lowering your head. This GPS navigation HUD image reflector can reflect phone GPS navigation image clearly in front of your eyesight. Turns any smartphone into a head-up display (HUD) for any car without lowering your head, bringing safety and convenience for driving. Built-in anti-slip rubbers on the holder, user can put their phone on the holder just by one hand, fast and convenient to use. The mirror is made of high quality PMMA, scratch resistance, clear image. 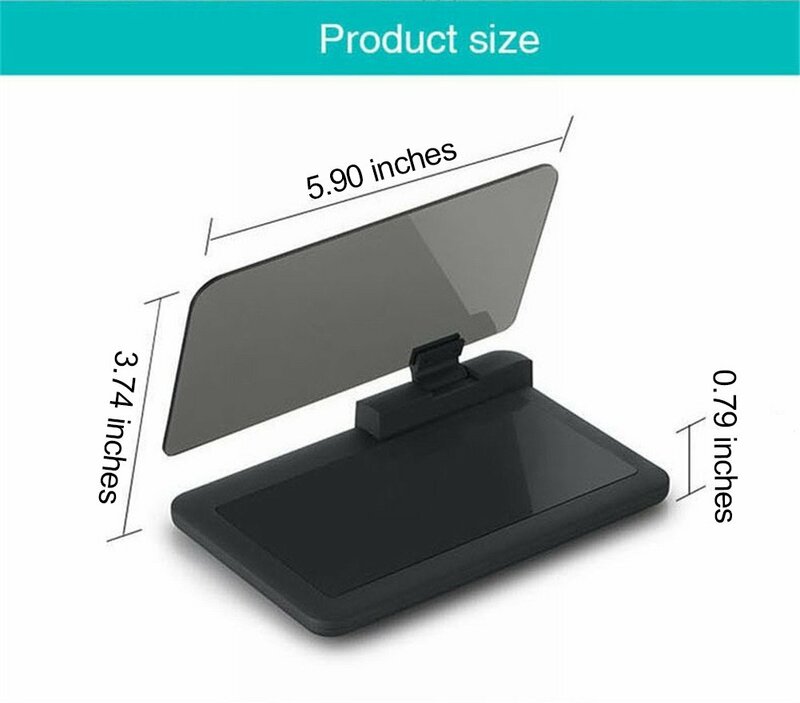 180 degree rotatable mirror, quickly setup with anti-slip rubber pad. It can be placed on the center console, convenient for driving, easily fixed, anti-slip and safe, unblock the eyesight. It is suitable for most of the Android smartphones and for iPhone that within 5.5 inch, widely compatibility. Big images - produces 20% larger images. Works with any smartphone and HUD app. Assists without distracting - glass transparency allows for a clear road view. Cleaning the surface on which is to be placed. It is generally recommend to clean the surface with dipped cloth. Place the phone on the stents anti-skid mat and adjust the organic glass board to the appropriate angle according to each individual visual angle. The HUD Mobile Navigation Device can be placed in the center console and the best visual angle is 45°. It can be also adjusted according to individual preference. Starting your car after opening the mobile navigation system and setting the proper route (now most of the navigation systems contain a reflection mode).